Whether you're new to diabetes or have had it for a long time, you may have heard that bread is "off limits." For some people, this makes managing diets easier—ditching bread eliminates the need to worry about or decide what kind to eat. Understandably, though, you don't want to feel restricted and would rather learn what types of breads are best and what you should look for when shopping for a store-bought brand. The good news is that if you have diabetes, you can eat bread—and there are plenty of healthy choices! Whole grain breads such as whole wheat, rye, sprouted breads, and organic whole grain varieties are rich in vitamins, minerals, fiber, protein. These types of breads are superior to refined, processed breads, like white bread. It's important to take a stance on what your focus is. For example, are you looking for a bread that is strictly low calorie and low in carbohydrates? If that's the case, you may find some really good options, however, these choices may contain artificial ingredients, flavorings, and other additives. Or are you looking for a bread that is organic, free of GMOs and has a good amount of fiber and protein? These options are available too, however, you may have to spend more money on breads like this. Whatever type of bread you are looking for, sticking to some guidelines can help you make an informed decision. We've also included some good choices, many of which have been recommended by people with diabetes as well as other certified diabetes educators. There is something for everyone. And if you aren't sure if your bread is the best for you, ask your dietitian or certified diabetes educator. For people with diabetes, there are things to consider when purchasing a bread. When reading labels, you'll want to look at the calories, carbohydrate, fiber, fat, and sodium. You'll also want to read the ingredient list and make sure your bread is whole grain. Calories: It's best to keep your bread around 90 calories or less per slice, especially if you plan on eating two slices. Breads that contain nuts and seeds can be a good choice as they contain some healthy fats, protein, and fiber, but they will be higher in calories. If you'd like to choose a bread like this and the calorie count is high, you'll want to keep your portion to one slice. Carbohydrate: When you have diabetes, watching your carbohydrate intake is very important. Carbohydrates are the types of nutrient that impact blood sugar the most. Depending on your meal plan and how many carbohydrates you aim to eat per meal, most people benefit from choosing a bread that contains 15 to 20 grams or less of carbohydrate per serving. Fiber: Fiber is an important nutrient in the diet, especially for people who have diabetes. Fiber helps to slow down how quickly blood sugars rise, increases feelings of fullness, pulls cholesterol away from the heart, and helps to keep bowels regular. Aim to find a bread that is a good source of fiber and contains at least 3 grams in a two-slice serving. Fat: There are different types of fat—saturated, unsaturated, and trans fat. People with diabetes want to eat a diet that is low in saturated and trans fat and contains adequate amounts of unsaturated, heart-healthy fat. Most breads aren't very high in fat (unless they have seeds or nuts). However, you'll want to choose a bread that has 0 grams trans fat and less than about 1.5 grams saturated fat. Sodium: Diets rich in sodium can contribute to elevated blood pressure, especially in people who are sensitive to salt. Aim to keep your bread to about 150 mg or less per slice. In order for something to be a whole grain, the first ingredient should say "whole." You can also confirm a bread is a whole grain if it has the whole grain stamp. In a perfect world, we would all make our own bread using the highest quality ingredients. But, realistically this isn't possible for everyone. Commercial breads use many additives to help flavor bread, maintain shelf-life, and shorten dough rising time. Additives are deemed safe by the FDA in the amounts they are presented in the bread, but that doesn't make them ideal. Some ingredients you'll want to shy away from include high fructose corn syrup (which is associated with obesity and other health issues), partially hydrogenated oils (aka trans fat), and dough conditioners such as azodicarbonamide, DATEM, and artificial colors. Whole Grain Bread: A bread that is 100 percent whole grain is a bread that is made with the entire grain intact, which increases its nutrition profile and typically lowers its glycemic index (how quickly blood sugar rises after consuming it). It's important to read labels carefully. Don't get tricked by labels that read multi-grain or seven-grain—this doesn't automatically make it a whole grain bread. When in doubt, check the ingredient list or look for the whole grain stamp. Sprouted Breads: Sprouted breads contain no flour—they are made from sprouting grains, beans, and seeds in water and combining them with freshly sprouted live grains. Next, they are mixed into dough and slowly baked into bread. This process helps to lower the glycemic index of the bread and increases the nutrition profile. Most sprouted grains contain all nine essential amino acids and are rich in protein and fiber. They can provide a tougher texture and should be stored in the freezer for optimal freshness. Ideally, you'll want to toast them and eat them right away. Therefore, they may not make the best sandwich to take on-the-go. Sourdough Breads: Some people just cannot get used to the texture of whole grain bread or other sprouted grains. If that is the case for you then perhaps trying sourdough bread is an option. Organic Breads: Organic breads are made with organic ingredients and produced without using conventional pesticides, fertilizers made with synthetic ingredients or sewage sludge, bioengineering, or ionizing radiation, which means they do not contain any pesticides, herbicides, or genetically modified ingredients. These may be a bit more expensive and not offer much benefit carbohydrate-wise. Gluten-Free Varieties: Just because something is gluten-free doesn't necessarily make it healthier. But, some people with diabetes also have celiac disease and must avoid gluten. If you have Celiac disease or avoid gluten because you are sensitive to it, finding a healthy gluten-free bread can be a struggle. 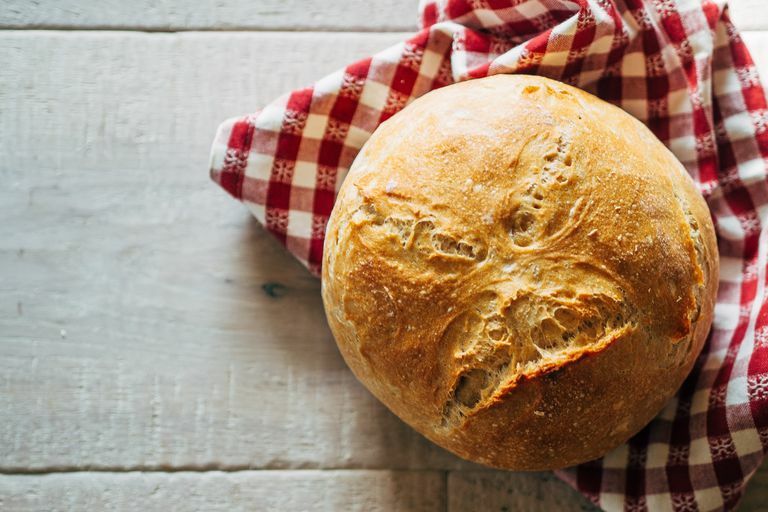 Gluten helps to give bread it's elasticity, therefore manufacturers often use alternative ingredients, such as refined starches, to help replicate the texture. When looking for a gluten-free bread, stick to the calorie, carbohydrate, fiber, and fat guidelines mentioned above as best as you can. You'll also want to try to choose one that contains whole grains, such as, brown rice, millet, and quinoa. Below you'll find some top bread picks from people with diabetes, dietitians, and other certified diabetes educators. They've been chosen based on likability and nutrition profile. You'll find whole wheat varieties as well as rye, sprouted breads, and organic varieties. Remember, when in doubt discuss your bread choice with your dietitian and if you are wondering how your blood sugar responds to a certain bread, you can test your blood sugar two hours after ingesting—if you are at goal, it's a good choice for you. If you have diabetes, bread can still be part of your meal plan if you choose wisely. When searching the grocery aisles, make sure to read the labels and check for things like calories, carbohydrates, and ingredients. Aim to choose whole grain varieties that are low in added sugars and rich in fiber. Whether you are choosing whole wheat, another whole grain variety, organic, or gluten-free, there is something out there for everyone. Ye EQ,et. al.Greater whole-grain intake is associated with lower risk of type 2 diabetes, cardiovascular disease, and weight gain.J Nutr.2012 Jul;142(7):1304-13. Is Honey or Sugar Better for People With Diabetes?